I've got two USB-based network adapters laying around here: the official Apple USB 2 Ethernet Adapter and this USB 3.0 ethernet adapter based on the Asix AX88179 chipset. Huh weird, no difference. I'll go and check where the bottleneck lays. VPN? scp? That's better. So the bottleneck is apparently the physical (ethernet) connection I've got, which is VLAN'ed to provide a guest network. Oh well. Long story short: better check this guy's test results. You should be able to get up to 110 MB/s. I'm running a little comparison of the file system of a Mavericks install and a Mountain Lion install, to see what's new and what has disappeared. Mavericks also added Ruby 2.0 (up from 1.8 in Mountain Lion). AppleIntelHSWVA driver, HSW is Haswell, but VA? AppleThunderboltIP, that's the driver for tunneling IP over Thunderbolt, duh :D I'm confused if this has anything to do with the Thunderbolt ethernet driver, I don't think so. pluginkit -- manages the PlugInKit subsystem for the current user. It can query for plugin matches, as well as explicitly change the plugin database. ioalloccount -- Summarize IOKit memory usage. taskpolicy -- execute a program with an altered I/O or scheduling policy. Not sure how this relates to the standard Unix commandline utility "nice"
Recently I got a MacBook Air, but it wasn't within my budget to get the bigger SSD. The standard SSD is advertised as 128 GB. In practice, this means 112 GiB, so I went looking for additional ways to get some extra storage space. First and most cheapest, you can get an external harddisk. On one hand, it's very cheap. On the other hand, you have to remember taking it with you, and it's another wire and another device on your desk. As an extension to that, there's the various wireless external harddisks. This Lifehacker article lists a few: Add Wireless Storage to Phones, Tablets, and Laptops with Wi-Fi Drives. Of these, I really like the Verbatim Store 'n' Stay because it seems the smallest of the bunch. There's also a number of solutions that use the SD-card slot. They're basically adapters that take a micro-SD card. They're sized such that they sit flush with the outside of the MacBook. I've got it fitted with a 16 GB micro-SD and it seems to work fine. There is no loss of speed noticeable, when comparing with the micro-SD-to-standard-SD-adapter that came with this card. Since the SD card slot on the 2013 MacBook Air is connected via the USB 3 bus (instead of USB 2), it shouldn't be limited anymore by USB2 speeds (i.e. theoretical maximum of 480 Mbit/s). The new limit is 5 Gb/s. So I ran a little test of whatever I've got lying around. I used the Black Magic disk speed test, with a 1 GB test file. It's not a very interesting test; none of these is above the theoretical maximum of 60 MB/s for USB 2. There have been some improvements to Google Sheets, including offline editing in Chrome. The release notes mention that since Google Drive version 1.9, "you’ll be able to access your most recent Google documents on drive.google.com, even while offline. Simply open any Google document from your local Google Drive folder and Chrome will display the file for you to edit". Note that this goes for documents, not for slides or sheets. Here's a couple of problems I encountered with Google Drive. The major problem I have is the offline feature of Google Drive. The obvious problem is that although Google drive seems to sync everything to your computer, that's not the case for the Google Apps documents (docs, drawings, sheets and slides). These are just links to their online version. Thus Google Drive is two things: it syncs normal files to between Google and local storage. And it lists all Google Apps documents. In that last instance, no real two-way syncing there. You can't create a local Google Apps document or something. You can, however, use Google Chrome (not any other browser), and say that you want to be able to work offline. You can then go to http://drive.google.com/offline. This feature doesn't come with Google Drive, nor is it enabled by it. It's a completely separate thing, and it will download your complete document storage again on your local drive, in your browser's cache. Being able to work offline means that you've got everything replicated twice on your local harddrive. In neither of these instances, Google Docs was able to keep up. Sometimes, the interface doesn't load. Sometimes, it thinks it loses connection because the speed is in the range of 8 to 40 Kbit/s. Often, it fails to save the last typed lines and says I should reload the document (which then loses the last sentences entered). All the time, it displays errors about not being able to connect, a vague error about server error, or about reconnecting. All in all, it works when you have a steady net connection. But the technology isn't there yet. Small update. Google introduced QuickOffice back into the App Store. It allows you to edit Microsoft Office documents. This sounds great in principle. There's a couple of things I find weird with this. Firstly, this app is separate from the Google Drive app and I can't seem to find a good reason why. Secondly, the iPad now offers something that Google Docs (in your browser) does not offer. Thirdly, the QuickOffice app has a weird 'file cache', a storage area on the iPad itself, where you can create and edit documents. You can mail and print them, but you can't copy them to Google Drive. In my opinion, this is too complicated. In my opinion, it would be much better when you could simply say: "In your browser as well as on your iPad, Google Drive can edit all sorts of files in your browser, including MS Office". We're not there yet. And I wonder if we'll ever see a full-fledged offline editing solution for Google Docs. After all, why would they? Then Google has to open their file format, just like Microsoft was forced by law to do with the Office file formats. Now you can say that Google is a lot more open, because you can easily download the documents in other formats. But you can't really -- they're not natively editable anymore after exporting. You could export, then import them again, but that is a bit strange for a document that's yours, and you'll lose lots of markup in the process. I think Google sees the complex and weird situation that now exists, and I am very curious about the future. Today I got curious what the speed differences are when you use a different cipher for an SSH tunnel. I've read about fake oversized thumb drives / USB sticks, which report a much bigger size than they actually are. To test the real capacity of an USB stick under OS X, we'll create a test file and write it to the USB stick a number of times. Then we'll verify what has been written with a couple of terminal commands. This is a pretty brute-force test and I'm sure it can be done much smarter. I'll give an idea on speeds, and I assume USB 2.0, and also assume a maximum write speed of 15 MB/s, and maximum read speed of 30 MB/s. Furthermore, we're working with 1 GB equalling 1 thousand million bytes, because that's what they use on the packaging. First, we format the disk. Start Disk Utility and erase it. This is to remove any files in the Trash. Notice the capacity in the lower right. In this case, it's 16 GB. We'll need that later. In the case above, the USB stick is called 'storage'. Go there. Now copy the test file a number of times, as much as the number of gigs you expect on the USB stick, in this example, 16 gigabytes. To write a gigabyte, we need to write our 100 megabyte testfile ten times. 16 gigabyte times 10 is 160. A gigabyte takes about 1 minute and 10 seconds to write optimally. The OS might be able to completely cache the source test.bin file in memory, which saves on reading time. Probably, the last file will fail because although the stick might be 16 gigabytes, the filesystem also uses up some space. Display the checksum of the first file. This can take half a minute. Now test the checksums of all files, excluding the correct results. My 16 GB stick took 8 minutes. If something went wrong, then you should either see the OS give errors, or some files should give a different MD5 hash. As mentioned above, you can probably ignore the last file, which may not be fully written to disk. 2) Edit the file /etc/X11/imwheel/startup.conf to enable imwheel when you log into KDE. Find the line that starts with IMWHEEL_START, and set it to 1. 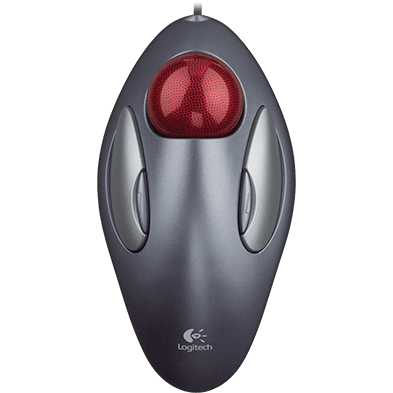 The Logitech Trackman Marble trackball. More on this procedure later. On my bog standard MacBook Pro, it seems that there's an update problem with Google Drive. It fails to automatically update itself. Perhaps it has to do with the fact that I'm running as a standard user, not the Administrator that OS X supplies by default. I found others who share this problem, and decided to write a little shell script that checks the current version against the new version. Run it once a week and see whether you need to update or not. wget --quiet --no-check-certificate -O "$DEST" "$URL"
#echo "old version: [$PREV_VERSION], new version: [$VERSION]"
echo "Google Drive is up to date." If it finds that you need to update, switch to finder and see that there's an opened DMG. Stop Google Drive, install the update and have fun. Today, we ran a little test of the SAFARI demux/fee-scripts. It's the second time this week, and I'm quite happy how it all turns out. We're finding some issues, but it's developing into a base from which we build a complete system. First we tested the menu for the testpulse generator. This is an important part, because the testpulse generator can simulate a detector (with a pulse, it's like a particle hit the bolometer). It's fed into the feedback. Besides pulses, we can also generate a square wave. This allows the user to inject high frequencies into the system, which is apparently used to assess its robustness. For now, I'm just taking note of that. When that appeared to work, we continued with the pixel menu. This is a part of the script that allows you to put a carrier wave routed to a certain pixel. You can change characteristics such as amplitude and frequency. We found some bugs there, but nothing serious. We then turned on pixel 1, and routed the testpulse generator to that pixel, configured to generate pulses. The plot option has a number of options. The above plot is a "normal" plot (in the time domain). If you would zoom in, you'd see a sinus. The plot shows 400,000 samples or so, thus we'd just see a dense area plotted. The first part of the plot is pre-trigger data. Then the test signal generator pulses, and the amplitude drops. The logic behind that, is that our sensor behaves like a resistor. Upon particle impact, the resistance raises, thus the amplitude of our biasing signal is lowered. And that's why you see the "trough" in the plot above. It's also possible to get a spectrum (i.e. plot in the frequency domain). We played with that too, and found some issues there. Finally, we used the Demux Test menu choice, and configured it to grab data from ADC 1, which measures the error signal. This is the difference between the feedback and the input of the SQUID. The error signal is the cause of overdriving the SQUID. Because it's so sensitive to this, we want to eliminate the error signal as much as possible -- thus it's important that users can measure and plot this signal. All in all, a nice result to head into the weekend. May 1st brought us an awesome episode of the In Beta podcast on the 5by5 network. Basically, Gina Trapani explains how it feels to a developer when her project is forked, and that forks take many different forms. Ultimately, it looks to me like good stuff is coming out. Previously, I described how we measure the transfer of the AC bias. Why do we put a test AC signal on the feedback coil, instead of sending it straight through a pixel on the sensor? Because each pixel has a hardwired LC filter, we could say. But that feedback coil is there, because the SQUIDs hardly have a dynamic range. Let me put this in other words, because it's extremely important to understand the whole setup. The SQUID is a very sensitive magnetometer. Thus the smallest change of flux will cause it to change its output. The output looks like a sine wave, thus it has an extremely small dynamic range (namely, the flank of a sinus). This means that we need a feedback loop that holds the SQUID locked to an output range. Because we have more than one pixel, we would run the SQUID out of its dynamic range. Thus the feedback loop ensures that, within its dynamic range, the SQUID can add all the pixel carrier waves. To make this measurement, we use a set of registers that allow us to configure the Demux board to start spewing data over the second optical network link. It's very flexible and can be viewed as a number of digital data taps located on several points of the Demux board. You can set the data source, the amount of data, the trigger source, and finally whether you want a specified number of data blocks or just continuous data. The data source can be configured to the ADC, the DACs, or the demodulated output of pixel 1 to 16. The ADC is of course what we need currently, but you can also read out the DACs. This is useful to check that the FPGA algorithms (more on that later) are correctly working. Finally to read the demodulated output of pixels is hugely useful, because (1) (see below). The trigger source is worth a different topic, which involves explaining what the sensor actually measures (X-rays or infrared signals). The options currently are: testpulse generator (2), level triggering of selected pixels, both of these options, or just auto (get all the data). Set the data source to read out the ADC that's on the Demux board (there's two ADCs for historical reasons, but we only use the first one). Set the amount of data. We need to experiment with the amount that we actually need to request. As the trigger source, we currently set it so data is always, and immediately, returned. (1) Demodulation saves us bandwidth as well as processing on the PC. (2) The testpulse generator is used to generate fake detector signals, to test the complete signal chain. You can test demodulation and/or test the electronical system. It generates the ideal detector signal. You can send the testpulse generator signal to the feedback coil of the SQUID and measure the PPM drift of the signal chain. Here's my version of a state machine in Objective-C, useful for your iOS or Mac OS X projects. There are many like it, but this one is mine. I've modeled an alarm clock here. What I like about it: it's pretty small and light on the objects. The state transitions are the only thing that's done with an object, and even these could be replaced with a struct, but that causes problems with ARC (which doesn't like function pointers in structs). The code below is WTFPL-licensed. Just so you know. The header file contains the enums for the states and the actions. Note that these actions are both used as a return value and as an input value. The implementation file starts with the init method, which sets up the state transition table. Basically, this table says: given a state and a resulting action, what is the next state? Furthermore, it contains a function that does all transitions, a function that looks up the next state, and the state methods. // We found the new state. Another routine in the system is the AC gain curve measurement. This routine is different from the previous one, 2013-04-09 Characterizing the transfer of a voltage biased SQUID. In that routine, we just looked at the DC part of the amplifier chain. In this measurement, we assume those measurements were successful, and that the amplifier chain was set according to optimal parameters. And since our instrument basically uses AC biased TESes (as explained here), we want to measure the transfer of the AC bias, after the SQUID has been configured optimally. This is very interesting, because that means you see the instrument as a whole, instead of characterizing a small part. So what we're going to do, is sweep the AC bias and then measure back the result. On the Demux board, there are two DACs that can drive the SQUID in the cryostat. There is also an ADC to measure back the result. The FEE board is in between here, but for now we can ignore it. The cryostat is where the above sensor is located. It has an array of TESes, each with its own LC filter. The user needs to be able to adjust the AC bias signal. The FPGA exposes a number of parameters for this, but we just need the frequency and amplitude, it's a really small signal: 2 MHz at 1 uA. Both are adjustable, and I'll add a setting for 1 and 5 MHz as well. We retrieve the data asynchronously. This is rather different from our usual way of getting data; i.e. normally we'd just polling a particular register. In this case, the hardware has a special function called the "science switch". A possible analogy could be that this science switch acts as a number of water faucets, where you'd just let the raw data stream out of the board, from specific points. Since water and electronics don't mix much, it's actually a number of registers. I'll write more on that later. On the left, you see a single SQUID. This is the pre-SQUID. In the middle, you see an array of SQUIDs. We functionally treat that last one as a single squid, calling it "the" array-SQUID. These two types of SQUIDs are biased differently; the pre-SQUID is voltage-biased, and the array-SQUID is biased with a current. You can view this combination as one "dual-stage SQUID". So what we do, is: we set a current over the shunt on the left. This will put a voltage on the pre-SQUID and a magnetic field will form on the inductor next to the array-SQUID. We'll read out an output voltage on the right. Now normally, the amount of voltage we put on the pre-SQUID would overdrive the array-SQUID. Thus, we put it in flux-locked loop. This is a mode where the array-SQUID simply passes current that results from the changes in flux. Because the array-SQUID is in flux-locked-loop (FLL), we can measure the output current of the pre-SQUID without a dynamic range limitation (+/- 500 uA). This flux-locked-loop is nothing more than a feedback circuit which forces the bias of the array-SQUID down to zero. Note that this is all DC-biased. The SQUIDs are part of the amplifier chain, and the whole amplifier chain is DC-biased. After we've characterized the amplifier chain, our primary purpose is to read out the sensor, consisting of a TES array that's AC-biased, see also 2012-07-02 Minimizing amplifier chain offset. Secondly, about the routine itself. I said "characterize the transfer". The transfer means: what is the effect of the input on the output. If you draw this function, you'd ideally see a sinus. We want to know in which voltage range our pre-SQUID behaves the best (i.e. where it has the highest dynamic range. In other words, you want to pick the voltage that's right in the middle on a flank. Because that way, with a little bit of input, you get a nice stretch of usable output. Compare it to a radio that can receive a lot of stations. If the above didn't help, or isn't applicable, continue. What it comes down to, is that I was using SSH from my MacBook (running OS X Mountain Lion 10.8.3) to log into my Debian Linux server (running Squeeze). Apparently, after logging remotely into Linux, the SSH client sets the LC_CTYPE environment variable to the same value as OS X. This conflicts with the LANG environment variable that Debian sets by default. That's because under Linux, the LANG is an overarcing variable, from which others, like LC_CTYPE, can be derived. That wouldn't be a problem, except the LC_CTYPE variable its contents are differently formatted under OS X and Linux. The warning says that it's "falling back to the standard locale". That means nothing will be translated, and only ASCII will be used when printing characters. No unicode support, I guess? Instead of unsetting LC_CTYPE, you can also go to the Terminal app its preferences, open the Settings tab, select your profile on the left side, go to the Advanced tab, and uncheck "Set locale variables on startup". There's a number of guides on the internet that talk about minimizing cellular usage. Often, they go into generalities, like "don't watch streaming video". Well, duh. I'm not going to offer general tips, but instead list a few settings for the iOS and some popular apps so your iPhone (or iPad) prefers WiFi whenever possible. TidBITS: What’s Behind Mysterious Cellular Data Usage in iOS 6? If you want to forcibly drain your iPhone battery for some reason, first configure the display. Turn off the auto-lock, set the auto-brightness off and manually turn up the brightness to 100%. The possible reason is, that you're trying to check in too early. So although you might be able to check in for the first leg, you're too early for the second leg. This situation had me stumped twice, until I realised the above reason is what might go wrong. The error message is not very helpful of course, so I'm hoping this is the actual reason, and documenting for everyone else. Here's hoping Google finds this.